Conference proceedings are available to all full 3-day conference delegates: log in here. The proceedings include submitted abstracts, PowerPoint presentations, synchronised audio files, video files of selected sessions, poster presentations and full papers. For all other event participants, or for those who did not attend, find out how to purchase the conference proceedings. The world's largest offshore wind energy event broke a new record this year. 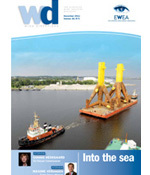 With over 8,200 participants and 8,000m2 of exhibition space housing more than 480 exhibitors, it is the biggest and busiest EWEA OFFSHORE wind energy conference and exhibition to date. 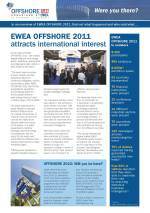 EWEA OFFSHORE 2011 offered networking opportunities aplenty. 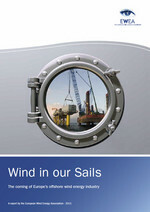 Over 8,200 key players from the offshore wind energy industry came from across the globe to meet and do business in this flourishing industry.